Where the Bridge will be. Have a look under "Update", how it looked four month later. Pillars of a big Bridge. The official signboard at the riverbank. The roadlink to highway 1020 on the Thai side. 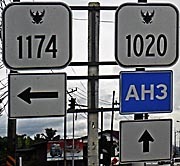 AH3 is the name for the overland route; highway 1020 leads to Chiang Khong and highway 1174 to Chiang Rai. 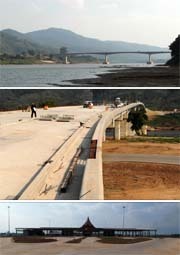 The bridge over the Mekong River at Chiang Khong/Huayxai is completed now. 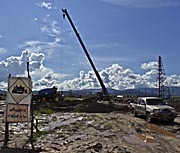 Also the road connection to the main road (highway 1020) five kilometers south of Chiang Khong is done. Allegedly there was a ceremony at December 12th, 2012. For some people, according to the ancient Mayan calendar, the world would be destroyed at this very date, for others, particularly the Chinese, it's a symbol of luck. And luck means always, above all, good business. Nevertheless, the bridge and new border-crossing is not in use yet. The immigration buildings on both sides are still under construction. In January it was supposed to be ready for operating in April 2013. But meanwhile there appeared another delay. Due to information I got from the custom officials in Chiang Khong, one of the construction companies has 'money problems'. It concerns probably to the construction of the new customs buildings. The officials told me that the new bordercrossing point will supposedly open in July 2013. Southeast Asia's economies are booming since decades. Singapore reached the top of the development in the world region, followed by Malaysia and Thailand. Nevertheless they are still so called "developing countries". That means that they follow the pattern of Western modernization. Building up industries and infrastructure, forming a modern nation state with all the consequences for the people living there. Being competitive on the world market. There is a history behind the bridge project, which is described here in short words. In the 1960's the USA invested much money into Thailand, building it up as an ally against the communist movements in Vietnam, Laos, Cambodia and Thailand itself. Starting the Vietnam War, the USA gave initial input in the Thai infrastructure, particularly in Isaan, Northeast Thailand, where they built the first highways and other facilities for their military purposes. After their eleven years lasting military engagement in Indochina the USA, militarily beaten, withdrew from the region. American investments declined in the region, due to the fear of American investors, the "Domino Theory" would become true and Thailand would become a Communist country. That was wrong, but the beginning was done, a basic infrastructure was created. In the 1980's Japanese companies came as investors, bringing much money and development into the country. But the economic growth was still limited. There was a Cold War Border between Western orientated Thailand and it's eastern neighbours. Cambodia was havoced by the Khmer Rouge. Laos, always a small, unimportant, forgotten country, was under a Communist dictatorship, any development was limited to Vietnamese and Chinese support. And Vietnam and China themselves where not strong, facing huge domestic problems. There was no thought of opening the eastern borders of Thailand for trade. In winter 1987\1988 there was even a border war between Thailand and Laos. The situation changed in the early 90's, after the collaps of the Soviet Union and it's satellites. China was reforming it's system since 1978 already and made significant progress in developing the country. It joined actually the bad sides of Communism and Neoliberalism, meaning a radical relentless free market economy coming together with a one party dictatorship. This pattern now became the model for Laos as well. The Communist countries became willing and even keen on opening their borders for international trade, getting more competitive on the world market. As a result of this development the first Thai/Laos Friendship Bridge at Nong Khai\Vientiane is to see. From then on the countries were focusing on opening new trade routes for mutual benefits. Since the infrastructure is so thin, there are still many potentials. In this content the bridge and road project is to see. If it will fullfill the expectations, and especially by which costs, is a decisive question. More important seems actually the whole content of modernization and it's critics. But this would burst the story about the bridge, which is intended to be described here in rather short words. At now ferry services between Chiang Khong (Thailand) and Huayxai (Laos) are running currently, transporting trucks, cars and motorbikes. People, among them many tourists who travel to Laos, are carried over the Mekong River by small longtail boats. The new bridge is planned since several years already. The construction is just at the very beginning, and at the moment there seems to be no ongoing. The bridge will have two lanes, each lane 3,50 m wide. 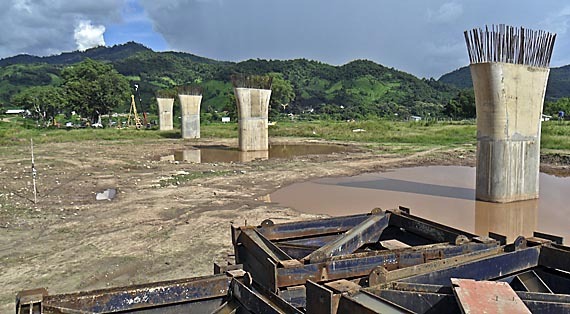 Total width of the bridge will be 14,70 m, it's length 480 m; the total road length to the main road connections is than approximately 11 km. After several delays due to disagreements among the three countries over the project's budget, the politcal instability in Thailand and the global financial crisis the opening, first announced for 2011, will now supposed to be in late 2013. The location of the bridge is not in Chiang Khong village itself, but some 5 km south of it. 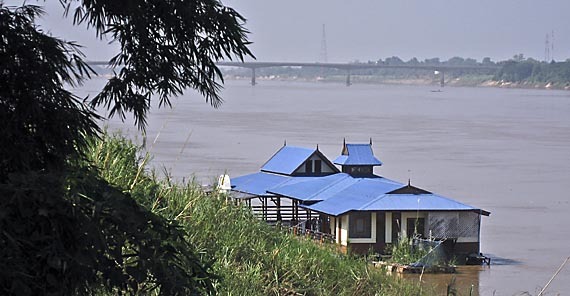 It will be the 4th Mekong River Friendship Bridge after Nong Khai (1994), Mukdahan (2006) and Nakhon Phanom (2011? - not yet ready). The costs were first stated with $US 32.000.000, but, as always with public infrastructure projects, it gets much more expensive then. The highest cost I found in the net is stated with $US 60.000.000. It's said that the costs are equally shared between Thailand and China. The design will be the same as the Friendship Bridge at Nong Khai. 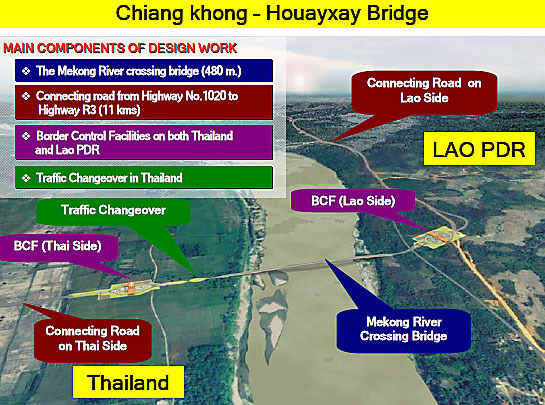 The importance of the bridge is that it will bridge the bottelneck of a long road connection between Thailand's urban industrial regions (particularly Bangkok and around) and the markets in Laos and China, partially Vietnam as well. The whole economic region is called the "Greater Mekong Sub-Region North-South Economic Corridor". The whole route will connect Bangkok with Kunming, Yunnan province, China, including all the areas between. That looks roughly so: Bangkok - Chiang Mai - Chiang Rai - Chiang Khong - Huayxai - Luang Namtha - Boten - Mengla - Jinghong - Simao - Yuanjiang - Yuxi - Kunming. The total lengths is 1.855 km. In the big picture it is part of a highway network linking Singapore to Beijing. 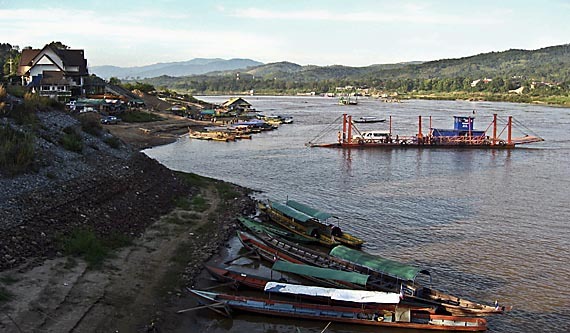 The part between Chiang Khong and Boten is 270 km long, planned as a seamless highway. 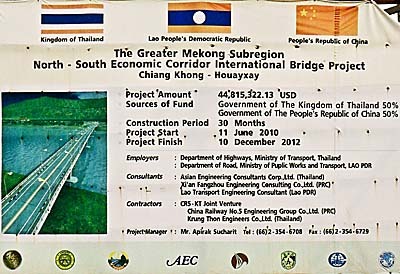 The road is a $US 97.000.000 project, financed with a loan from the Asian Development Bank and money from China, Thailand and Laos. The old historical route, which was for long in a very bad condition and not usable in rainy season, is under improvement by Thai and Chinese construction companies. 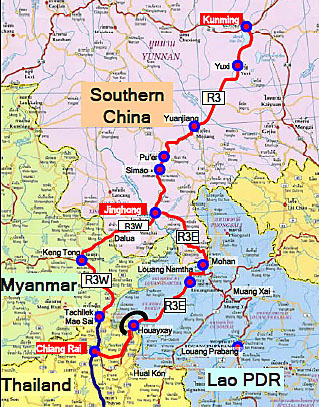 It was originally planned as a circuit project, leading from Chiang Rai in Thailand vie Mae Sai and Tachileik through Burma into China heading further north. But the part leading through Burma is passing in it's northernmost part insurgency territory, what makes the route there impossible. Till now there is no building activity on the route between Chiang Khong and Chiang Rai. This road is partially in no good condition and not broad enough for an increase of big trucks. "The main export items from Thailand have been automatic data processing machines, rubber, polymers, refined fuels, crude oil, chemical products, rice and tapioca products, whereas the top imported items from China have been computer parts and accessories, electrical machinery, iron and steel products and other metal ores and scraps, household appliances, chemicals, fertiliser and pesticides, fabrics and manufactured articles." Well, big money is playing here. There are high expectations bound to the project. There will be a much more efficient and rapid transport of merchandise and people between China and Laos, Thailand, Vietnam and even parts of Burma. Increased trade, transport, investment, tourism. China's southwest and landlocked province Yunnan finds a good export connection to Southeast Asian markets, until down to Bangkok, Singapore and it's distribution. 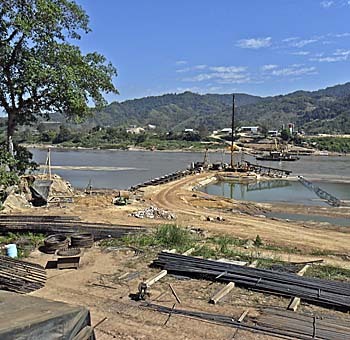 The Laotion government propagates the project (in combination with the other connections over the Mekong River at Nong Khai, Mukdahan and Nakhon Phanom) as a great developing opportunity for Laos, becoming a hub to all the neighbouring countries. Economic boost for Laos. Some poorer and remote Laotion regions will gain new trade opportunities, enjoying progress in some parts of the country. In general, as it is always said according to such infrastructure projects, it will bring an enhancement of business, employment (more jobs), and number of tourists. But it's not all sunshine. On the other hand there are serious concerns. There must be 171 families vacated in Laos for the bridge project. Land expropriations have been made. There were compensation payments for land, houses, livestock and farms. Was it a "fair" price for being displaced? Asienreisender couldn't find out much about the details yet. But, normally it's a very poor compensation, if not only mere promise. A lot more traffic will be, with all the consequences for the people and animals living alongside the road. That means a huge increase of pollution. The road could bring more criminality with it, like human trafficking and violence. More dangerous drugs like amphetamines will be circulating, more prostitution and more diseases such as HIV/AIDS are expected to follow. Overexploitation of the surrounding forrests and wildlife resources are to expect. Land grabbing along the new main route is reported, influential business people from outside obtain territory and launch new businesses alongside the road. Land speculation has happened. National politicians, it's said, bought already a great deal of land around the bridgehead in Nong Khai, because they were among the first who got information about the future bridge building, before the news were released to the public. Real estate prices around the bridgehead have been risen enourmously (due to speculation). For the Laotion and Thai sides are fears around that the new connection will bring an huge amount of cheap Chinese (especially agricultural) goods on their markets, with which local industries can't compete. An example are the Thai garlic farmers, who can't cope with the cheap Chinese imports. A great number of economic migrants could follow as well. This process is already ongoing, as many Chinese construction workers kept staying in Laos, starting local businesses as shops and guesthouses. Some Laotion towns, as Oudomxay and Luang Namtha developed recently a distinct Chinese character, which leads to tensions with the local population. China and Thailand, partially also Vietnam will rather benefit from the new trade route, but Laos could become the looser in the game, for many goods will be only be transferred over Laos into more developed regions in the neighbouring countries. Only more drivers will stop on the way and consume food, gasoline and rest in Laos. It's also said that there will be no motorbikes allowed to cross the bridge, as it is the case in Nong Khai. Critics of the project are e.g. the "We Love Chiang Khong Group", who also protest against dam construction on the Mekong River in China and rapids blasting in the Mekong River to make passages for boats easier, but for the price of damaging the river severly. As always with such economic developments there will be winners and loosers. The loosers are mostly the already poor and uneducated people and the nature. The winner is always the big money. But at least some local people get a chance to escape poverty, enhancing their living standards. China's influence in the region, through trade, investment and migration, will grow. The socialeconomic configuration of the region will alter significantly. Construction is Going On in the Dry Season. After a stillstand over some month in the rainy season the construction of the bridge is going on. Also the custom building makes progress again. On the road from Chiang Khong to Chiang Rai there is still no building activity. Partially the road is in a bad condition, the surface is broken over larger parts. That would be the shortest connection between Chiang Khong and Chiang Rai. But the chosen connection leads via Toeng. The road between Huayxai (Laos) and Boten at the Chinese border improved much in 2011. 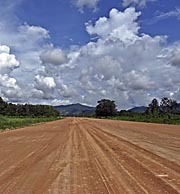 The road in Laos is under construction of the three countries Laos, China and Thailand. Each country has it's own section to build. A Laotian engineer claimed to me in December 2011, that the Thai side has to do it's section again, because the quality does not fulfill the stipulated standards. I heard that many times in Thailand, that granted money partially disappeared and roads lack sustainability. In the first months it all looks fine, but after the first rainy season holes and other damages appear. They didn't do the foundation well then. But, here it's an international affair and control from outside is set. Construction work is going on. The roadlink is under improvement and the future custom house is slowly growing up. One pillar is anchored now in the middle of the river. At the mainroad there is a new sign put. The announcement says now that the bridge will be ready in December 2012.